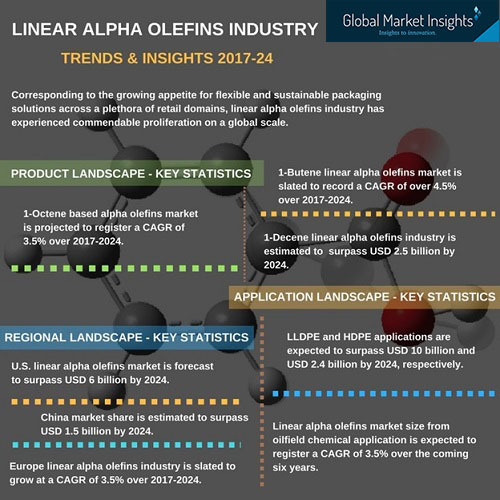 Corresponding to the growing appetite for flexible and sustainable packaging solutions across a plethora of retail domains, linear alpha olefins industry has experienced commendable proliferation on a global scale. Linear alpha olefins (LAO), mostly utilized as comonomers, has indeed traversed a remarkable jaunt lately pertaining to the increasing consumption of polyethylene, especially LLDPE (linear low-density polyethylene) as a packaging material. This is apparently vivid from the estimates which claim global per-capita consumption of LLDPE per person is almost 4 to 5 kilograms. Inherently driven by the obvious fact that low-density polyethylene is mainly manufactured by copolymerization of ethylene and higher alpha olefins including the likes of butene, hexene, and octene, the aforementioned data undeniably justifies the exponential demand graph of linear alpha olefins industry. Reliable statistics further convey that globally LLDPE utilization would grow at an annual rate of 5% over 2016-2021. Speaking of its impression on alpha olefins industry share, Global Market Insights, Inc. forecasts LLDPE applications to surpass a valuation of USD 10 billion by 2024. Europe is deemed to procure a position of supremacy in the global linear alpha olefins market down the line of seven years. As per authentic sources- Europe alpha olefins market size, in terms of volume is slated to cover almost USD 1.5 million tons by 2024, with an anticipated CAGR of 3.5% over 2017-2024. The principal factor that has complemented the regional business growth is the expansive automotive production and sales across European belt especially in countries like France, Italy, and Germany. Subject to the fact that these alkene family of organic compounds have been increasingly deployed as fuel additives for improving the fuel efficiency, the astoundingly mammoth automobile manufacturing across this belt certainly opens up a slew of opportunities for alpha olefins industry players. In this regard it is prudent to mention that the current regulatory framework of the European government continuously propagating automotive emission reduction and pollution control has further proliferated the regional linear alpha olefins market trends. The competitive spectrum of linear alpha olefins industry is all inclusive of biggies such as Shell, Chevron, INEOS, Sasol, Jam Petrochemical, Idemitsu, and Evonik Industries. Having already secured their presence in the lucrative business sphere, these giants, in the years to come, are expected to engage themselves in large-sized hefty projects, that would span almost for a decade or so. With leading giants driving the trends, experts claim mid-sized companies would also exploit maximum applications of alpha olefins and chance upon viable projects, which in the long run, would impel overall business outlook. Below mentioned is a glimpse to the recent contributions that two of the most pivotal linear alpha olefins industry players have made so far, which undoubtedly would quicken the pace of advancements in the business vertical, making it a viable growth avenue for potential investors. The British-Dutch oil and gas conglomerate, Shell, has been a part of alpha olefins industry since decades. Pertaining to the growing energy demand across emerging nations, in tandem with technological advancements in the extraction of shale oil & gas, demand for linear alpha olefins in the oil & gas sector has witnessed a marked rise over the past few years. In fact, as per estimates, linear alpha olefins industry size from oilfield chemical applications is slated to witness a y-o-y growth of 3.5% over 2017-2024. Chemical industry proponents’ increasing investments in the alpha olefins industry may be attributed to this fundamental aspect. Speaking of Shell’s contribution in the industry space, the company, few years back, in the year 2015, made it to the headlines with the announcement of its investment decision at its Geismar Chemical plant Louisiana in a bid to expand the LAO production. The Netherlands headquartered firm in cooperation with its Chinese partner CNOOC, back then, claimed to add world-scale ethylene crackers with existing complex through this investment. The company’s deep-rooted stance in alpha olefins industry is vividly coherent from the fact that recently, in June 2017, Shell updated the latest status of the humongous Geismar project. Sources claim that the construction of the plant has been on track since the beginning of 2016 and the commercial production, in all plausibility, would come onboard by the end of this year. Incidentally, through this massive investment, Shell is planning to incorporate 425,000-tons of AO unit annually to its existing structure, creating employment opportunities for around 2100 workers. As per experts’ opinion, the project, once onstream would not only position Shell as the largest AO producer across the globe, but would also be marked as one of the most significant events that linear alpha olefins industry has lately witnessed. The year 2016 had been a roller coaster of events for INEOS, another forerunner in linear alpha olefins market share. Somewhat toward the middle of the year, the London based chemical giant, came in the limelight with the confirmation of its FID (Final Investment Decision) to build a new linear alpha olefin unit at the company’s Chocolate Bayou, Texas site. Apparently, INEOS Oligomers, through this revised bid, claimed to produce almost 420 thousand metric tons of alpha olefins per annum, 20% more than that what the unit was supposed to produce originally. Reported to come onboard by November 2018, with this project, INEOS’s overall LAO production capacity is deemed to reach over one million metric tons per annum from this year end. The new unit, as per experts’ conjecture, was a major step taken by the company to strengthen its position in the competitive alpha olefins market, complementing INEOS’s existing units in Canada, Joffre, Feluy, and Alberta. Once again, in the month of September 2016, INEOS Oligomers had been in the news for its significant investment in low viscosity poly alpha olefins market. The deal apparently was propelled by INEOS’s long-term plan of increasing the supply of single train low viscosity PAO to formulate advanced lubricating products. Speaking of the agreement, one of the higher officials of the company was quoted saying that INEOS made this hefty investment in both PAO capacity and LAO feedstock supply in a bid establish PAO as a viable alternative for long term formulation option for synthetic lubricant production. Proclaimed to be world’s largest single train low viscosity PAO plant, INEOS’s new unit of 120 ktpa capacity is expected to commence its operation in the first half of next year. With a strong pipeline of large sized projects that is reported to be full-fledged by end of this year or next, INEOS, undeniably has taken quite some responsive stands in alpha olefins industry over the recent years. In the last half a decade, there has been a superfluity of investments in alpha olefins production across countries such as Egypt, U.S., that has had an unparalleled influence on linear alpha olefins industry expansion. Experts predict, the trend is likely to continue in the coming years as well, driven by the significant growth in shale gas exploration activities across these economies. The rise in the market demand can be also attributed to the increasing petrochemical demand and advancements in drilling techniques that has led to a smooth accessibility of raw materials even in outlandish areas. In this regard, it is prudent to mention that pertaining to the globally prevalent environmental concerns with regards to automotive emissions along with fossil fuel depletion, alpha olefin manufacturers nowadays have been heavily investing in R&D activities to develop bio-based products – a remarkably anticipated trend in the linear alpha olefins industry in the ensuing years. These encouraging advancements in the forthcoming timespan would not only make linear alpha olefins industry fascinating for lay consumers, but also for the entire research fraternity pertaining to LAO’s significant application scope in diversified domains.